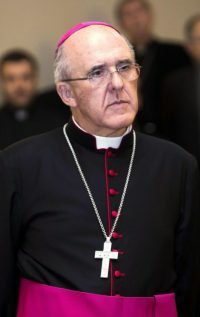 MADRID (CNS) — When his schedule permits, Cardinal-designate Carlos Osoro Sierra walks from his Madrid home to the Almudena cathedral. It should take only 10 minutes, but the walk is made longer as Madrid’s archbishop uses it as an opportunity to stop and talk with residents, shopkeepers and passers-by. “It’s the type of person he is and it’s his approach to his role: He tries to meet with everyone, regardless of whether they’re Catholic or not, regardless of what their politics and positions are,” said Rodrigo Pinedo Texidor, director of communications for the Archdiocese of Madrid. Cardinal-designate Osoro has drawn comparisons to Pope Francis, an association he has said is based on their physical similarities, said Pinedo. “When people have asked him about that comparison, he has said that what he wants to do is to be more and more similar to Pope Francis with his actions and with his closeness to the people,” he said. He said he would use the appointment to continue to carry out Pope Francis’ call for the Catholic Church to “go forth” and evangelize and help the poor. “To spread the joy of the Gospel, we must go out and be with the people,” he said. That message has been reflected in Cardinal-designate Osoro’s actions as archbishop over the past two years, said Pinedo. Since the announcement of his appointment, Cardinal-designate Osoro’s agenda has been flooded with requests from the media and different groups in Madrid. Yet he has kept to his schedule of celebrating Mass in prisons, where he speaks individually with prisoners, and visiting different neighborhoods in Madrid to hear from the people.